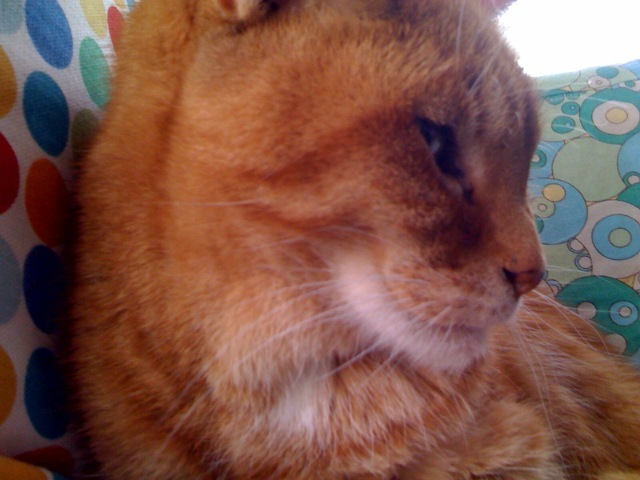 Donald has been a part of my life for seventeen years. Sadly, his health is poor and he is not long for this earth. He's been a riot. No other cat has his personality and you can be damned sure that he will not only be missed by The Prof, my family, and me but by many people who met him. I love you Busy B. The dark clouds looked really weird the other day so I took a picture of them. 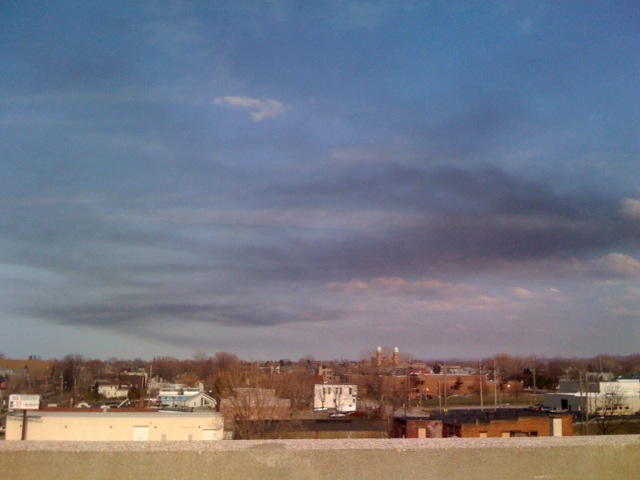 It almost looked like smoke which wouldn't be too shocking since I live in Pollution Town, USA. This is Mr. Stinny. 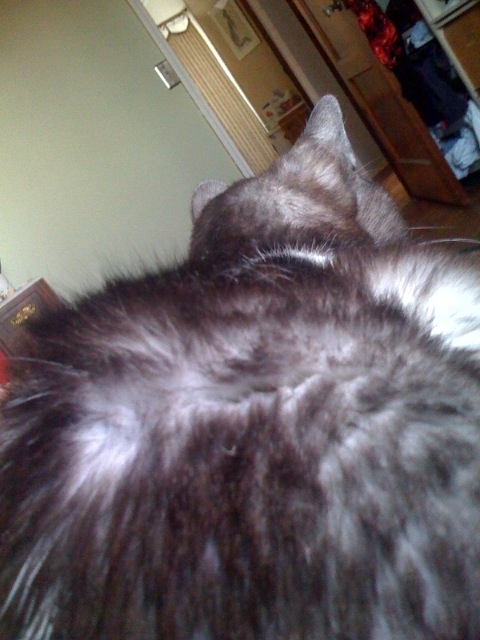 This is the view that I often get of Mr. Stinny. Mr. Stinny likes to sit my or The Prof's chest with his bum 2 inches from our face. Thank you Mr. Stinny for being so considerate of our personal space. By the way, he has the most gorgeous softest coat. It's called smoke or chinchilla because it's grey on the outside and white underneath. Despite his poor manners, he's a sweet and handsome man! 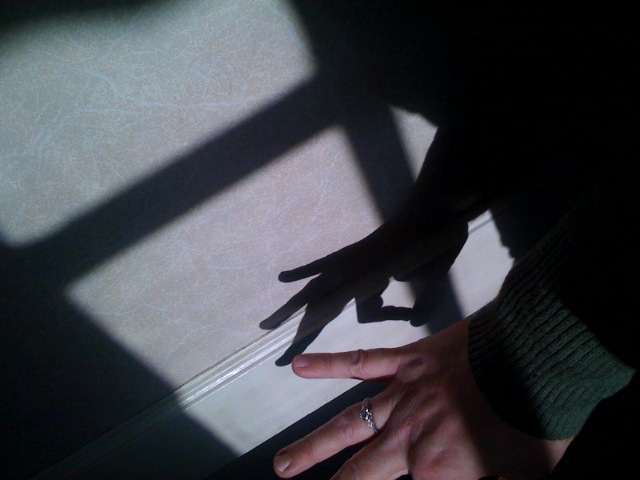 A perfect afternoon for shadow puppets and for lazing in the sun. Despite a lot of good guesses, only two people had the correct answer: paws. I would like to congratulate Lawyerchick from Lawyerchick who will get her $10 Gift Card mailed to her as soon as possible! I promise to make it easier next month so come back to the sandbox and play! Solve the Theme - The "Easier Edition"
Update: no one got the answer correct. I migth have made it too tricky so I'm adding a few more photographs. And the pinky guess made me laugh because I looked back and realized I was sticking out my pinkies in both photos. I also stick my pinkies out when drinking Yuengling because I'm classy that way. SO I am adding a few more photographs to "help" you. If you already guessed, you can have one more try. Good luck...again! The new deadline is Wednesday, March 12, 2008. I think I will start a "Solve the Photo Theme" on the first Thursday of the month because I am too lazy to write. 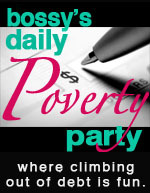 I did put "guess" in the title at first but it sounds too much like my blogging hero's "Guess and Press". Also solve has a math geeky sound to it and I secretly love to solve problems (especially Soduko) and play games.